We offer a wide range of pantry options. Request our spec book for details. Sizes: WIDTHS: 18", 24", 30" and 36". HEIGHTS: 84", 90", or 95". We offer pantries with shelves only, pantries with shelves AND drawers, and we have two optional accessories for pantries: pull-out pantries and a tandem basket pantry. 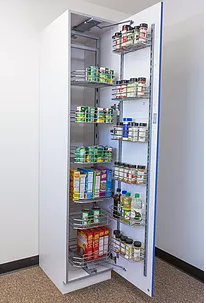 Pull-out pantries are available in 12" and 18" widths. They add style and functionality and give easy access to kitchen items with a smooth pull out action and heavy duty hardware, soft-close mechanisms and chromed, wire-frame drawer trays. 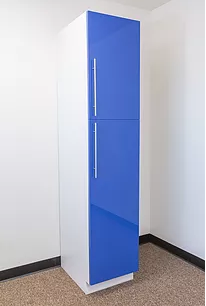 These tall pantry cabinets offer stylish storage and ease of access to kitchen goods. Heavy-duty chromed wire-frame baskets are mounted on both cabinet interior and along the inside of the door. The position of each basket is fully adjustable to suit your own needs. Soft close mechanism included.